As part of a monthly feature sponsored by PowerBar (www.powerbar.co.uk), Tri247 welcomes you to the Powercoach Zone. This month, coach Joe Beer (www.JBST.com), explains 'Two to One odds on'! PowerBar have been utilising the proven science of 2:1 Glucose: Fructose since 2006. All products with C2MAX contain an optimized duel source carbohydrate blend that is scientifically proven to increase performance by an average 8%. PowerBar is a global leader in sports nutrition backed by a unrivalled research and development program and cooperates with leading Universities, Institutions, Athletes and Coach’s worldwide to ensure we deliver cutting edge technology and keep ahead of the competition. C2MAX Technology can be found across the PowerBar range in the Energize drink, Performance bar, Energize bar, Gel and Ride Shots. Yes you've probably seen the adverts and product websites not to mention the odd evangelical athlete testimony with pretty outlandish claims. This makes sports nutrition sceptics of people who at the same time believe the petrol they put in their tank will make the engine last longer, or that a specific skin cream will stop wrinkles and aging. Sports nutrition alone offers gains in performance, above and beyond training and technology gains, in the order of 3-8% when used correctly. The only constant is change. What was “known” soon gets re-written or tweaked. C. Thinking that manipulating nutrition is a form of doping (the “not right” dope). We know that, if you want to go faster in OD, 70.3 and Ironman; recover better and be energized (and not a tri-zombie), you have to test carbohydrate and fluid intake in training and have a racing fuel plan. Pro athletes don't race on air and water in 3,4 or 8 hour events. Neither should you. However, until only very recently we generally thought that drinks needed to be around 5-7% carbohydrate, you could absorb no more than 60-grams per hour and the favoured version of sugar was glucose/glucose polymer. we now know from cutting edge research that by combining a precise combination of glucose and fructose you can push intake up and over 100-grams per hour and you can use this at the muscle at levels approaching 100-grams per hour. Repeated test data (and race data from pro’s – see the diagrams) show that athletes can intake up to around 2.5grams per minute of these “dual-fuel” carb drinks and the muscles can be supplied and use 1.75grams per minute for fuel. That’s a whopping 400 calories of premium fuel to your muscles, when once we thought you had to limit intake to 60 grams per hour. You would have only seen about three quarters of that arrive at the muscles, a mere 160 calories. By using products with what's been called the “2-to-1” carb ratio you are making use of two different sugar transporters in the stomach to get more fuel on board. It’s like having a second carburettor in a car so fuel gets in the engine faster. Fructose was once seen as a problem sugar because it could cause stomach distress, now it’s become the key cohort to glucose in 2:1 products. If you look at data below you can see its possible to push up intake and hence have more premium fuel to race faster. 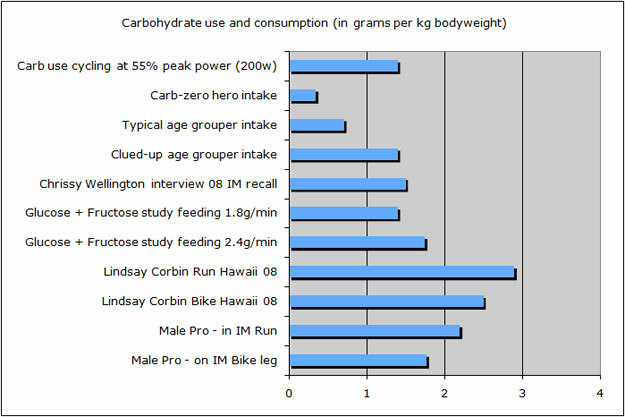 So its clear to me, looking at the data and hearing the experts talk about data yet to be published but already following the trend, that using the new forms of carbs, like PowerBar drinks and gels provided to you in races, means you can get way above the 1g/kg or 1g/minute barrier that people used to talk about. 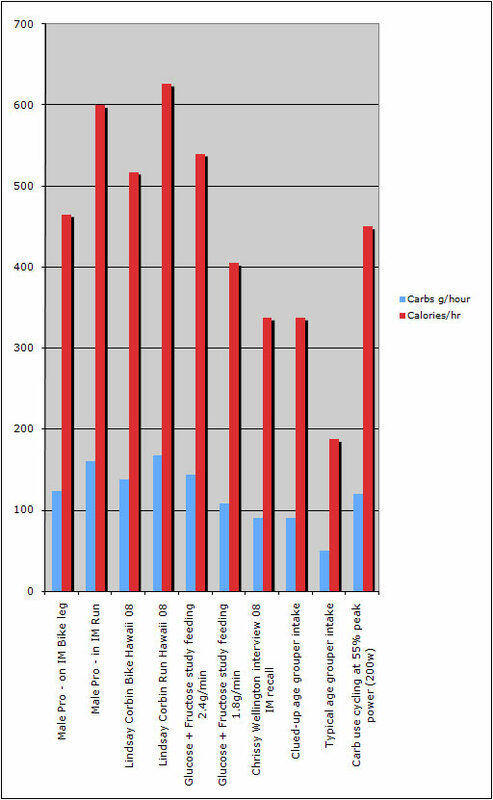 Take a moment to look at the graphs – can you see that a modest 200w effort (55% of the athletes peak power) uses up 450 calories per hour of carbohydrate. Do that for 3 to 4 hours in a 70.3 event and you’ve just taken out 1200 to 1600 calories of carbs. Do that on water and it’s a slow half-marathon. Do you use aid stations or aim be self-contained? If you aim to be self contained and only grab water then using two “2:1” gels per hour for a six hour bike leg means 12 gels are to be carried. Better to have that in a bottle (with a small amount of water) and slurp on gels than try to open them as you ride. Its easier to open and eat them on the run but at times a gel flask with slightly diluted gel mixture saves energy you just don’t have to give to fighting a gel wrapper. Where on the bike and the run are you carrying fuel? So think not just how many bottle cages or what run belt to use, rather where are the aid stations? At the top of a hill, on the fastest part of the bike, you need to know that to get your feeding timed well and not be carrying too much between aid stations. Two-to-one fuels work so I suggest you stick to them and not use a formula provided by race sponsors that you’ve never used or heard of. Have you got caffeine covered? Use flat scoops – knowing the exact weight (measure out 10, weigh it and move the decimal point back leftwards one place (e.g. 164g – for 10 scoops means 16.4g per scoop. If you want to practice you must know what you are using in key training sessions, normal training and actual races – start writing it down and preparing nutrition for long sessions precisely. In can take a while but this is your own personal lab testing so take the time to be doing it right. Aim to push your intake up 10-20g per hour every once in a while to test your limits. Athletes can get used to 15% concentration Powerbar drinks and thus consume 90g per hour from just 600ml drinking – ideal in cooler weather. You can dehydrate, probably up to 3% without significant performance losses (Haile Gebreselassie lost 4% in his marathon world record), so the old chestnut that “2% loss of mass equals 10 percent performance drop” does not stand up to scrutiny. Getting carbs in is more important than over hydrating, use thirst to sense hydration but keep the carbs going in at a level of >1g/kg/hr. The science of 2:1 carb feeding is solid. Embrace it and you can enhance your performances, whether you are a 2:35 Olympic distance racer to Hawaii Ironman wannabe. Swim smooth, bike safe and run light. You should never be looking for the next short cut: training requires work and racing faster or further is hard work. Training is the strongest stimuli to getting better not a specific food, sports product or supplement. However, if you believe that manipulating any part of your diet outside natural foods is not ethical check the rulebook right now. If caffeine, sugar polymers, supplements or packaged nutrition is not your idea of the tri lifestyle have fun but you can't stop other athletes wanting to hear about how legal stuff that will make them faster.